Eland Books have just launched a beautifully edited edition of Alexander Burnes’ Travels into Bokhara. When the original was published in 1835, Burnes became an overnight sensation, lecturing to packed halls in London and even given an audience by the King. At the tender age of 26, Burnes travelled into the unknown territories to the northwest of the British empire in India, reaching as far as Bokhara in modern-day Uzbekistan. Dressed as a local and in command of the local languages, the brilliant Burnes reported back on the geography and politics of the region, right at the beginning of what later became known as the Great Game between the British and Russian empires. The launch for the book was held at 50 Albemarle Street, home to John Murray publishers for over 200 years, and in the very room where Burnes plotted his journeys into Central Asia. 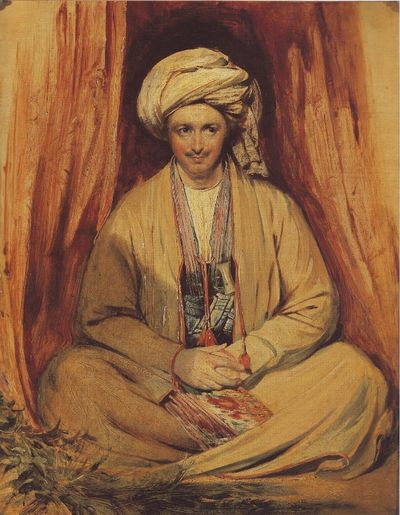 A small portrait of Burnes hanging there was used as a frontispiece for the first volume of his writings, but Burnes thought he looked like a carpet-seller, like a Bokharan, and in the second volume his moustache was turned down and his face became more serious. The original portrait, below, is on the cover of the new edition.